When I received my first ‘Save The Date’ card about four years ago, I wasn’t sure what the appropriate response should be. Usually, it’s one of joy. ‘Oh how lovely! X and Y are getting married!’…but what if the names you’re reading are so utterly unfamiliar that you start to convince yourself you may have blacked out for several years in which you became friends with ‘Mark and Belinda’? I’m now three ‘Save The Date’ cards in, the dates on two of which had long since expired by the time I opened them and the names on all three were unbeknownst to me. It always takes a good few guilt ridden moments before realising, my memory is, in fact, fine…I just do not happen to know the happy couple. Becoming “well known” didn’t happen overnight, of course, which means the skills to deal with being “well known” didn’t suddenly materialise for me either and often, there’s no amount of training that could prepare you for some of the weird s*** that comes your way when you’re in the public eye. In amongst the gorgeous messages of ‘thank you’s and ‘I respect what you do’s…there’s a dark side to it all that doesn’t dampen the good stuff in any way but it makes the whole package a little heavier and harder to hold. After all, what could possibly prepare you for someone repeatedly and forcefully trying to snog you at stage door in front of a crowd of onlookers who don’t know what to do or how to help you? Nothing will soften the blow of someone messaging you just to tell you how terrible your work is. Nothing can untie those knots in your stomach when you read the torrent of hate you get after having sheepishly announced you can’t make it out of stage door, or when you tweet that there won’t be a video that week or that the competition you’re holding won’t be worldwide but ‘UK only’. I don’t know or understand how to deal with half of these situations and it seems like there’s no one who could possibly tell me. This isn’t supposed to be a tale of ‘woe is me’. Who wants to give sympathy to someone for being “too loved” and “too admired”. I’m fine, of course! I have a great life and I’m grateful to each and every person who spends even a minute of their time on me. Only someone truly arrogant and heartless wouldn’t be! It’s just…a bit weird, isn’t it? Never, at any point in my life, did I imagine this many people would know my name and my face. Never did I think this would be my life. Never did I think strangers would invite me to their weddings and parties and christenings or just want to have a coffee with me because they admire my work. When I hear the words ‘excuse me’ when I’m out and about, I just think I’ve…I dunno…dropped something? Someone needs the time? Someone’s asking if I have a lighter? Do I know where this train’s going? It takes me a long old time to recognise their recognition and realise they know who I am (although of course, sometimes someone does just need the time…!). Seven years down the line, seven years where the chance of people recognising me in the street has been prevalent in my life and I still get a little bit freaked out when a stranger knows my name, even though I’m the one who plastered it all over twitter, instagram, tumblr and youtube! Sort of like when you call the cashier at a supermarket by their name and they have a moment of shock before they realise it’s on a badge that is pinned to their chest. And relatively, I’m not even that well known but it’s the YouTube side of things that makes it a little bit different. I chat about deep and meaningful stuff and I let people into my life which can sometimes be mistaken for a deeper connection than the simple ‘creator and viewer’ relationship that it actually is. However, often the interactions I have with people who watch my channel are gorgeous. People tell me where they know me from, sometimes they’ll even shake my hand, hug me and tell me their name! Sometimes they ask for a photo, sometimes they just want to say hi and after a minute or two of a little bit of chatter, we part ways feeling brighter! Other times, I get the feeling that now we’ve met, they’re under the impression that the natural progression is…we go for coffee. Now we’ve met, this changes things. Now…we’re best friends…and sometimes that has been the case. I’ve had someone follow me home and try to invite themselves into my flat. I’ve had people I’ve just met ask when they get to meet my nephews. I even had a stalker for a while which was terrifying when I was in a show and they knew where and when to find me six days of the week. People tell me that friends were once strangers who became friends. Which is indisputable. Totally spot on. Except…those friends were both strangers when they met. Neither had any knowledge of the other or very little at the least. It was an even playing field. When a stranger approaches me because they recognise me, they already know my name, my age, my birthday, that my favourite colour is green, they may have my social media bookmarked on their laptops and phones, they might have read everything I’ve ever written, they probably know how many family members I have and what their names are, they might know that I love watching Peaky Blinders and Victoria, they may know I love tea and coffee and cake, they may have seen me in one or two musicals or even every musical I’ve ever been in…to them, I am not a stranger. I am a fully fleshed out character with likes and dislikes, family and friends, and instantly, there’s an imbalance. Not only do I not know their name yet, but this is the first time I’ve ever even seen their face! Depending on how long they’ve been watching me for, it would take me a long time to catch up. The majority understand that friendship is something no person in the public eye (or even, no person at all!) should be expected to offer and that’s nothing to do with status, arrogance or importance. In my opinion, it’s mainly to do with time and quantity. It’s a hundred, a thousand, tens of thousands, hundreds of thousands, sometimes millions of people, looking at one individual who couldn’t possibly be expected to split their time evenly between each person whilst still maintaining the career that got them so well known in the first place, let alone their own personal life…surely? Not only that but are there even a million people who the celebrity would want to consider a friend? Is it possible to find that special connection with that many people? Of course, sometimes, it works out! I have a wonderful friend who I first met at a stage door. We had a chat, they gave me their number and made it clear there was no obligation to get in touch and they wouldn’t suddenly start turning up at stage door to chase me up on the offer. A couple of weeks later, I text them. Yesterday was our four year friendaversary! We meet up for coffee maybe twice a year if we can and natter away for usually what ends up being hours. Will, if you’re reading this, we’re overdue on that coffee! SOON I PROMISE! But am I now expected to text, tweet, email everyone who has ever given me their contact details in order to make it fair? I fear there is a minority that do expect just that and sometimes their opinions are loud and a little scary…! Stage Door at Les Miserablés! Nothing has changed for me in the last few years. Not in how I view myself in comparison to the rest of the population of the planet, anyway. In my head, I’m no different from “before”. Pre-Les Mis and pre-YouTube. Obviously, I’m older, I’ve grown up and I’ve learnt a lot. I’m happier with who I am but all in all, I’m still the same Fletcher I was years and years ago. Before anyone knew my name or would recognise my face. Like I said, nothing happened overnight but maybe the gradual increase made it harder to notice. Like a frog in a pot of water, if you gradually increase the temperature it won’t notice it’s being boiled until it’s dead. Before I realised where things were headed it was a little too late to be fully prepared for the situation I was already in the middle of. Now, I’m in a strange situation because I’m a normal person, right? I’m still a human being with feelings and thoughts and I’m no better than any one individual on this planet. But…I get followed home! People try to kiss me as I leave work! I may be a normal person but I find myself in situations that certainly aren’t normal which means I sometimes have to deviate from the normality of my own life in order to feel safe and happy. For example, not leaving through stage door sometimes. I know I’ve talked about that a lot but not in this context, I guess. The reason I sometimes don’t leave through stage door isn’t because I think I’m better than the people who have come to see the show. My own view of myself hasn’t changed. My own normality and self awareness aren’t the issue. It’s the fact that stage door has started to become abnormal. It’s become a place where people insult me, shout at me, push me, try to kiss me, go through my personal belongings and as a “normal” person…I find that incredibly intimidating and as a “normal” person, I’d rather not be put in that abnormal situation. So when the crowds at stage door are larger and there’s an increased chance of something abnormal happening, my anxiety grabs hold of my legs and changes their direction. It’s nothing to do with ‘celebrity’ or ‘fame’. If I wanted that celebrity I’d probably be there every day lapping up the love and attention despite the weird goings on that occur! In reality it’s my desire for normality that makes me shy away. My job is acting, writing and making videos and the publicity that comes from that is actually just a by-product of what I do as opposed to the reason I do it. So, am I allowed to be introverted, anxious and a little adverse to attention and yet still have a job that’s in the public eye? Can I write books, blogs and be in shows without relishing in the attention it comes with? Personally, I think I can but this conversation is born from other conversations I’ve had with people online and people in my own field who disagree or have varying views on the matter. Listen, this whole world of viewers and influencers (eww) is all so new in the grand scheme of things, let alone new to me. I don’t know what the hell I’m doing. Does anyone? I don’t write any word of this in complaint or anger…it’s more fascination. I’m completely fascinated by social media, fan culture, fan/creator relationships, stage doors and everything that comes alongside having a job in the public eye. I wish there was a handbook to navigating it all because thus far, I’ve been guessing and like all things, sometimes it’s joyous, sometimes it’s difficult and sometimes it’s crazy! As someone who’s gradually retreating from the spotlight outside of her profession, I’m finding it hard…which is probably why I’m blogging about it. For myself as much as to give others an insight into my brain and the reasons behind my actions. Wanting to retreat in no way diminishes my gratitude for everyone who supports me. I think I’m just learning that I love to be creative but I don’t really enjoy the attention it drums up. Whilst I will ALWAYS ALWAYS ALWAYS be kind and grateful to those who do recognise me, who do come to stage door and those who I meet one way or another, to actively put myself in positions where I’m likely to be recognised or to actively seek out that attention just ain’t my bag! I always find your views on stage door really interesting. I can't believe how much it's rocketed for you, particularly in the sense that it has encouraged a younger audience into a whole new experience of theatre. I think in that way it has been positive, it's great to get younger audiences into the theatre and for them to see you and the cast do what you are passionate about. I remember reading all of your tweets through the not so great parts and wondering what on earth happened?! Hopefully, in time there will be an acknowledgement and better understanding of what is appropriate and I hope it'll make you have more positive experiences. Not many people in the public eye are this candid about how it feels to be on the other side of our adoration. I really hope you continue to talk about this topic as it may help individuals learn to have healthier relationships with public figures. Congratulations on the gorgeous new blog! This was oh so great and interesting to read! It still absolutely baffles me to know that some people think they’re entitled to certain things as a “fan” or an audience member. I will often go to stage door, however here in Australia it doesn’t get nearly as hectic as it does over there, but if there ARE a lot of people (for example, the last show of Book Of Mormon in Melbourne was INSANE!!) I’ll just decide to head off and be grateful that I got to see and enjoy the show. If I meet somebody I admire in the street, I might ask for a selfie and say a quick hello if they don’t look busy, but I’m not entitled to that. If they’re in a rush or having a bad day etc. then that’s FINE, since they’re HUMAN. Sometimes I see people I know on the street and just can’t be bothered so I quickly turn the other way, and if I get that privilege to avoid seeing ONE person, then you should also have that privilege. As a kid who has grown up going to see shows and being involved in local theatre productions, I really had no concept of the whole stage door shenanigans until a couple of years ago. It just seems really strange to me, if I go to see a show my way of showing appreciation to the cast is to applaud during the bows and in exceptional circumstances a cheeky wee standing o'! I witnessed an Addams Family stage door from a far while I was catching up with my pals after the show and it looked intense plus is was raining so that's less fun. When I leave my job that I do everyday I barely have the energy to make it to my car let alone have to deal with the unpredictable situations that you can find yourself in. Keep doing your thing and know that I'll be cheering you on from my seat in the theatre- before dragging myself back to my car to drive home hahaha! It's great to hear from the other side of a fan/creator relationship, and I'm glad that you are able to share how you feel and your thoughts about this situation you find yourself in. As a fellow introvert, I couldn't imagine how daunting and crazy it must be to have thousands of complete strangers know your name and so many things about you! Congratulations on your lovely new blog - it looks fantastic!! I delivered a little present to Stage Door one of the nights that you weren't coming to stage door and went on my way. 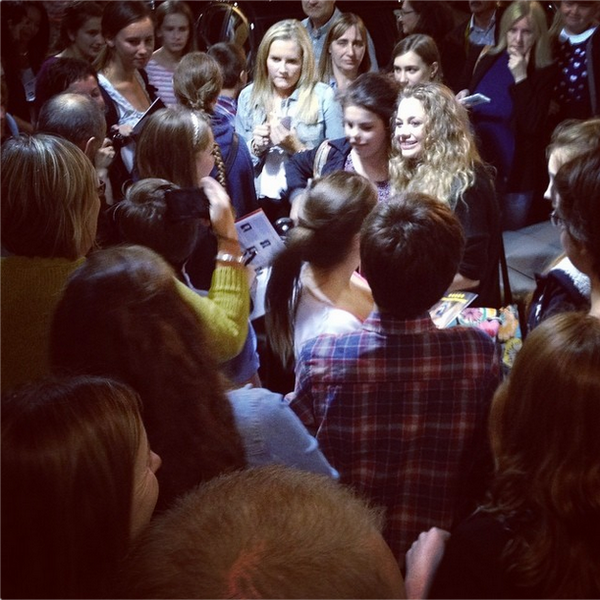 Even though there were posters all round the theatre showing you weren't coming to stage door there was still a huge huddle of excited fans at the door. I guess "just in case". I had left my address in the envelope - I think I may have even included stamps and figured maybe a something would appear back in the post. In fact a something did arrive in the form of a signed photo and a scribbled message so that you so much for taking the time. It's currently hiding somewhere on my very messy desk but when I track it down again it's going to be stuck into my journal with lots of other fun exciting things. 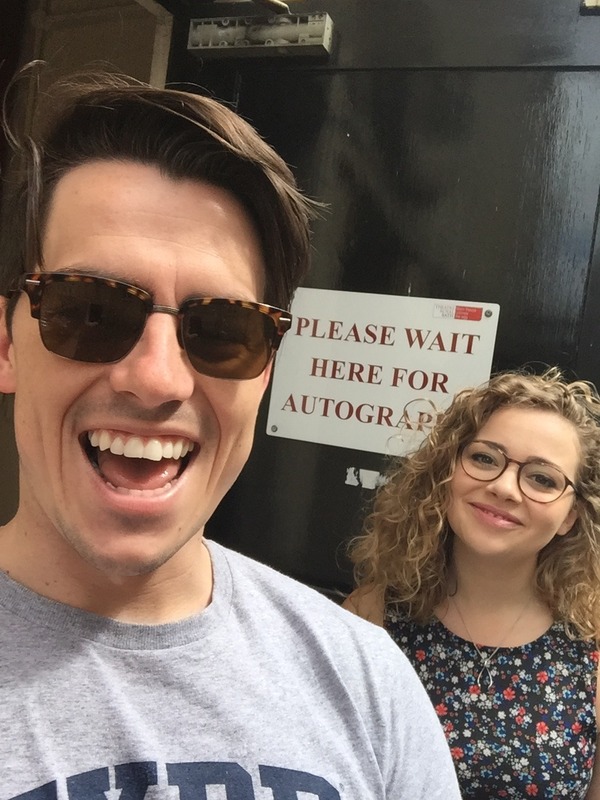 We went to see Hamilton on Friday and could only spot Stage Door based on the crowd that had already formed there. It was a bit insane to be honest! My friend who I was with is a regular theatre goer so did actually say about going to stage door but decided given it was raining she would just have to go back to see it again another day! When I have been to "meet and greets" or signings after concerts etc I've turned into a bit of a gibbering mess! I met Cerys Matthews at her concert. It was a small venue and I was sat right in the front row right in the middle and felt like a right weirdo when i kept mouthing the words along. I got all excited and told her about International Velvet by Catatonia had been on repeat in my car all week and that even now (like 10+ years after it was released) It's still one of my favourite albums ever! I read this on my phone and then came here to check out the theme (just a tip some of the pictures are too wide and come out huge on Safari - yay for technology lol). As a fellow introvert (who is often perceived as super confident), I totally get where you're coming from. I actually moved to London a few months ago and the bustle of the city is overwhelming enough, without having the continuous demands from complete strangers that you do. I think that fans sometimes tend to get wrapped up in the lives of the people they admire a little too much. I try to keep a very surface level of interaction with content creators/artists that I follow online. It really helps to remember that there is a real person on the other end of the communication. Like, would you be bold enough to say that to their face? Well then it probably doesn't belong online. And how would you react if numerous people approached you in the street? Proceed with caution. Life is hard enough without being cornered into disappointing people. This new blog is GORGEOUS! I think this will be an amazing way to share your thoughts and feelings as well as a place to express all that creativity of yours! I know that I find the concept of expecting friendship from a celebrity/youtuber/writer etc is wrong and those who seek it should think about the other person and the pressure that is put on them from such a request. There are some people I would never dream of being friends with, simply because I know that we are so different that a friendship just wouldn't be plausible. In other cases, I could see a friendship. For example I feel that you and I probably have a lot of similar interests, but does that mean that I will bombard you with a want of friendship? No. As much as you may think you have in common with someone, you can never know until you get to know the real them, not their online persona. You may think there's an equal playing field but there is that chance that you'll always think of them as some form of royalty instead of just a friend; plus if the 'celebrity' cannot see you as a friend instead of a fan, a friendship would be futile and would never last, it would probably just leave you both feeling neglected and insecure as to why it didn't work, even though it wouldn't have worked in the first place. As for stage door and the fame that comes with your work. You were not to know how much people would love you and how much people would try to get close to you. You are completely right that these things ARE abnormal, so to expect them would be insane. In my personal opinion, anyone who has met you or seen you from afar (not as a character) would be able to tell that you are not in this workplace for the fame. 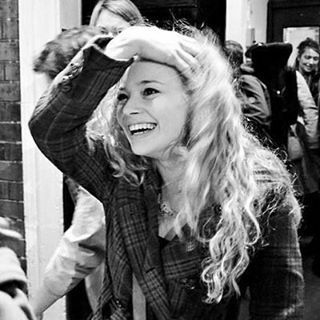 Your face is a picture when you leave stage door, your smile is beaming and the ever-growing surprise that people are there to see you shines in your eyes. As much as 'ignoring the haters' is difficult, please try, because all of the Hopefuls truly understand and I think I can speak on behalf of most if not all when I say that your health and happiness comes above anything and everything else. I kinda feel like I need to apologise. I remember meeting you 5 years ago through Twitter because we organised a "meet up" with only 4 of us (Hopefuls) but not because we wanted to be friends but actually we just wanted to have fun and meet new people. You weren't even supposed to meet up with us, that meeting was supposed to be strangers meeting for the first time because of you, because of the positivity you gave us. After all of this I absolutely loved meeting you every time I had a chance. Doing the Hopefuls meetings were amazing, it isn't possible anymore I've my own job, career no more free time like I used to and right now I feel bad that I actually came so many time at stage door. I know I'm not the only one that saw your fame growing up and I have to say it, that scares me (not as much as it probably scares you) But I remember your final year at Les Mis, the final show and the number of people at stage door and at that point it hit me, I was done with Stage door. That atmosphere was crazy/scary for me and I felt so uncomfortable being there. I hope I will be able to meet you again, and I really hope you never thought I was a Stalker because that is definitely the latest thing I want people to think about! You gave me a reason to stand up for myself through your positivism and I will never be thankful enough. I'm so glad you've decided to blog again and I really enjoyed reading this. I'm an actor too, nowhere near on the same scale, and I find unless I have family and friends watching, I absolutely cannot walk out to the audience or even to the bar where everyone has collected after the show. I find it so intimidating having reams of people ready to pass on their judgement, positive or not, and I tend to slip out the back entrance because my job is on stage and well, that part is over. I cannot imagine how overwhelming it must be for you and how much expectation there is to behave in a certain way. I still don't really get the fan thing. Sure there are writers and actors that I look up to but the obsession truly is a frightening thing, especially as you are so down to earth with it all and don't play up to the whole 'fame' narrative. Anyway, loved reading this and looking forward to more posts! Some people just don't know where to draw the line. They see you as public property and forget that you are a real person with feelings. In many ways acting is just a job the same as being a teacher or nurse. How would an everyday person cope with being hounded for autographs and photos constantly? I am a collector of autographs. I am someone who will go to a stage door in the hopes of meeting someone. I'm not very good at pushing myself forwards though and the thought of standing waiting and asking for an autograph does make me very anxious. Usually I go with my friend so he can do the asking for me. Some people get really pushy and just shove their book or leaflet in the person's face and expect them to sign it. There's no please or thank you. Some people push in front of others who have been waiting ages without a thought for manners. I believe you should be polite and respectful when asking for an autograph. If the person says no or not today then yes it's sad but there is usually a good reason for that. I waited hours to meet Sophie Ward at a stage door and when she arrived she said she couldn't sign any autographs as she was running very late. This was before the show started. So after the show I waited again and when she came out she recognised me and apologised over and over for her earlier rudeness and how bad she had felt not being able to sign my book. She chatted for ages and was lovely. I hadn't minded her having to dash and I said as much but some people would have been offended and vented their anger on Twitter or some other media outlet. You should treat people as you would want to be treated! 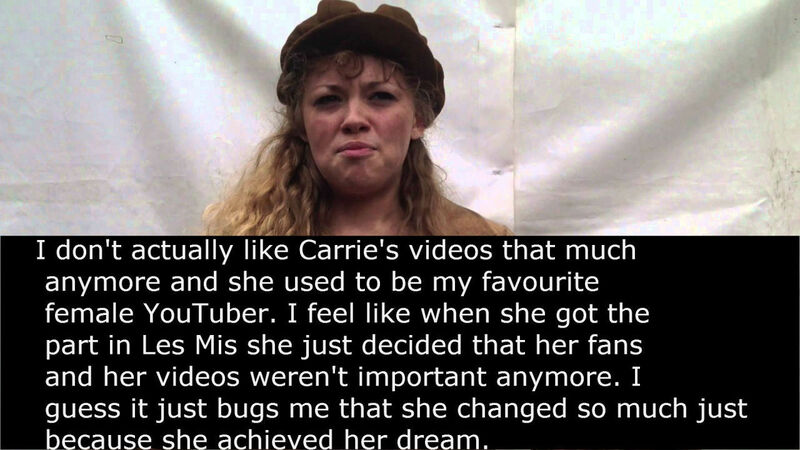 I fully agree with you Carrie. After a long, hard day, the last thing you'd want is to be bombarded by people who think they know you. Not only is it intimidating, it's incredibly rude. Rude for them to think they have the right to anything, just because they know your name and have seen/watched/read everything you have released. Celebrities are human beings too, and are entitled to their own life, and more to the point, entitled to feel safe. Nobody should treat anyone the way you've been treated, regardless whether that person is a celebrity or not. I just don't understand the way these people think. I'm sure there are good, honest intentions behind most of it, but some fans need to stop and think about the person they admire, and how they feel. If I ever met any celebrity, I'd probably freeze and go really shy and not know what to say. I certainly wouldn't try and kiss them, and as you say, ask to meet their nephews. That's such an invasion of privacy. It's rude and it's wrong. A lot of the negative experiences you describe are technically harassment. Harassing people is Never Okay, whether the person is a celebrity or not. Don't ignore your discomfort surrounding the situation just because you feel you have to be "grateful" for the admiration you get from others. There is a line (not even a fine one) between admiration and creepy, obsessive stalking. The latter is a crude violation of boundaries. Your blog expresses the loop of mental gymnastics I would do when I first started experiencing sexual harassment before realizing it was sexual harassment. The logic leaps of "should I really feel this uncomfortable, after all they just wanted a date..." when I would encounter guys aggressively pursuing me and yelling hateful things at me when I didn't return their attention. I then realized that these people weren't just desperate for attention - they were creepy, hostile, and sometimes dangerous. You are talented and you have many fans who admire your talent, but said fans aren't entitled to anything from you. It should be enough for fans to get to enjoy the art you create and put out there - they don't deserve anything else in the way of your personal time and attention. Tune out the weirdos and take care of yourself.